Home » What is the Best 6-Gallon Air Compressors? What is the Best 6-Gallon Air Compressors? 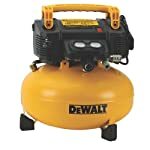 What is the best 6 gallon air compressor? Which one should you get? Is this the right model to get your jobs done? In this buying guide, we walk you through all the key features and what you need to know about so you can make an intelligent decision. We recommend reading the full article before making a final decision. It’s important to understand your personal needs and what you want to do with your air compressor first so you have a frame of reference to evaluate the various 6 gallon air compressors we review here. If you just want to get stuck in and start shopping for the best 6 gallon air compressors, then you’ll find our favorite models ranging from $100 to $600 in the quick comparison table below. An air compressor is one of the most important things in any factory or workshop. It is also one of the most effective and cost-efficient pieces of equipment you will ever own. With an air compressor you can complete your construction, maintenance, automotive repair, hobby, and craft projects faster than with traditional tools. You can use an air compressor with a variety of air tools like nail guns, hammers, spray guns, impact wrenches, air drills, paint sprayers, sanders, saws, tire inflators, and many others. Air compressors can also be found in a wide range of environments for an even wider range of uses. In fact, you’ve likely been around many different kinds of air compressors and didn’t even know it — they may be hidden away in your refrigerator, wine cooler, heat pump water heater, or air conditioner. Air compressors can be used for many types of jobs and applications, and they are available in a wide array of sizes, but for the purpose of this article, we’ll just focus on air compressors with a 6 gallon tank which is best for occasional pneumatic tool use or for some light-duty household applications like inflating tires and sports equipment. 6 gallon tank is the most common size of air compressors for home use. But is this the right size for your needs? Air compressor tank sizes are measured in gallons and will affect the use of some tools. Typically, the more continuous-use air tools, like sanders and grinders, will demand a bigger tank than tools that are used intermittently, like staplers and nail guns. 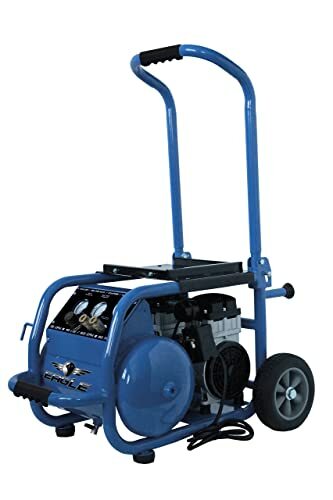 A typical 6 gallon air compressor is small and provides low flow of compressed air for short periods of time, it can’t be used to power the tools like sanders or grinders. These air tools require an air compressor with at least a 60 gallon storage tank or more. Staplers and nail guns just power through smaller bursts of air and don’t use that much air from the total tank allotment, so an air compressor with a 6 gallon storage tank is a perfect choice because the tank can quickly refill itself. 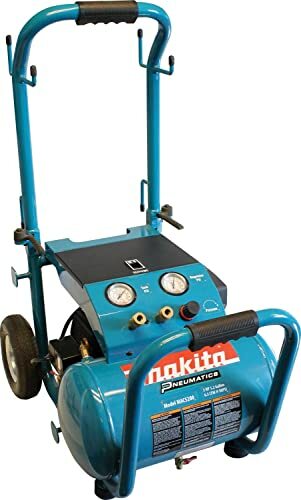 If you’re powering a number of different air tools over a long period of time, or you want to use your air compressor for painting, you’ll have to get a bigger tank, probably at least 20 gallons – we suggest you get a 30-gallon air compressor if you can afford. The bigger the storage tank, the longer the air compressor runs without a refill. What is the best 20-gallon air compressor? There are so many 6 gallon air compressors on the market, it would be difficult to buy the right model for your needs. Below are some of the key features that you should look at when shopping to find the best 6 gallon air compressor. Before buying an air compressor you have to decide whether you’ll be going with a gas or electric model. 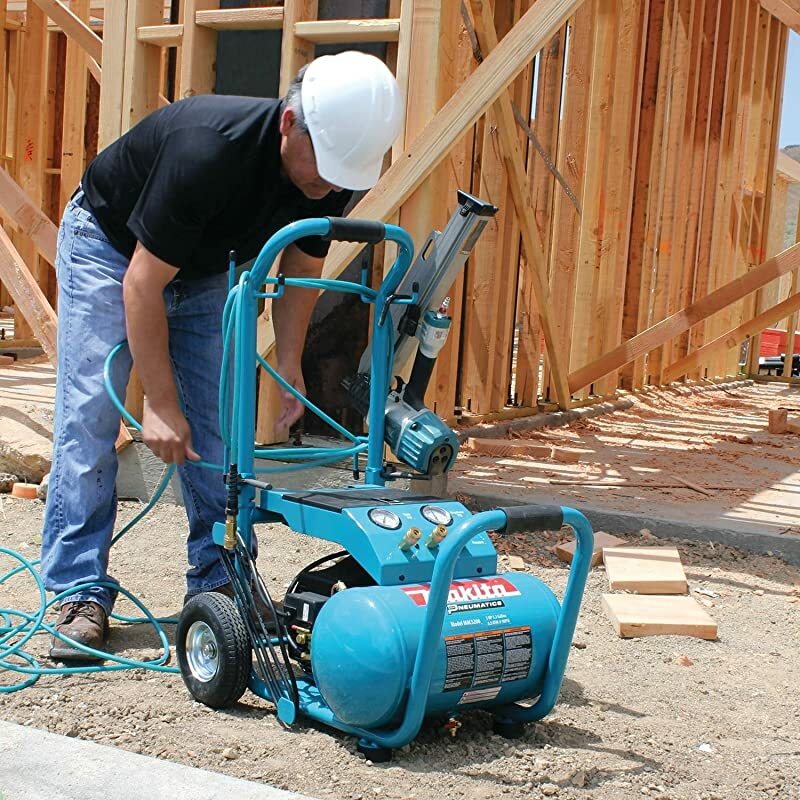 Gas-powered air compressors are ideal for job site pneumatic applications where electrical power is not available. They require gas to run and emit fumes, so keep in mind that they cannot be used indoor. Electric air compressors are usually more convenient than gas-powered units if you have electrical power sources close by. They are less expensive and often used in a number of different applications. 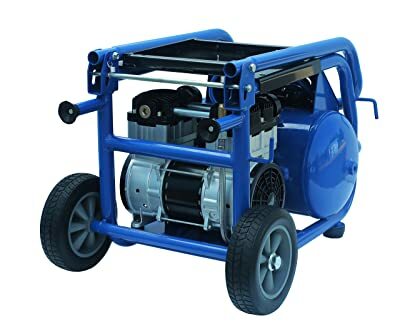 However, electric air compressors are less portable for construction or industrial work and not as good at heavy duty types of jobs as gas compressors. 6 gallon air compressors are relatively small, and usually have one tank (pancake or hot dog). Most of them are powered by electricity that makes them lighter, smaller, more environmentally-friendly and safer for indoor use. All models we’ve reviewed here are electric-powered air compressors. Pancake air compressors: are small and lightweight for easy storage and portability. They are oil-free and have no belts so there is virtually no maintenance needed. They are also the least expensive types of air compressors. But they are quite noisy. Hot Dog air compressors: are slightly bigger than pancake versions and are somewhat heavier. These air compressors usually come with wheels and handles that make them easier to move. Like pancake air compressors, most hot dog compressors are oil-free, therefore, they are noisy. However, most hot dog units are quieter than comparable pancake units. If you’re looking for a quiet 6 gallon air compressor, it’s better to buy a hot dog version, like this California Air Tools 5510SE Ultra Quiet Air Compressor. The chart above shows which tools can be used with your air compressor. That information based on the required airflow rate of air tools which is measured in cubic feet per minute or more commonly CFM. Before selecting an air compressor for any application, looking at its CFM first to make sure that it will meet requirements for the tool to function properly. We recommend increasing the CFM total you get from the highest rated tool (or the total number of highly rated tools that could be used at the same time) by 50 percent to ensure that you have adequate performance under the most demanding applications you may encounter. For example, if a tool requires 2 CFM at 90 PSI, select a compressor that delivers at least 3 CFM at 90 PSI. CFM requirements are usually listed on the packaging and can also be found on the manufacturer’s website. What horsepower (HP) is needed? Horsepower is important, but not nearly as important as CFM when choosing the best air compressor. The horsepower is a rating for the motor or engine’s power. The motor creates the compressed air and delivers it into the tank. The higher the horsepower, the more efficiently the air tank will be filled, which reduces the recovery time. However, air compressors with higher horsepower tend to run hotter than others. So when purchasing a new or used air compressor, pay attention to the CFM rating first and all else second. What size generator to run a 6 gallon air compressor? A typical 6 gallon air compressor will need a 7-15 amp circuit. Running this compressor off a generator you will need a 2000 watt generator for the air compressor needs on startup. We would recommend a 3000-watt generator for a better performance. Belt-driven Air Compressor: Belt-driven compressors generally have a longer life, with less vibration and heat transferring from the motor/engine to the pump. Low oil protection: The best air compressor should be equipped with technology to shut itself down in the event of low oil levels, preventing downtime and expensive repairs due to low fluid levels. Oil-Free: an oil-free air compressor reduces maintenance and does not mix oil into the compressed air. There are a lot of amazing 6 gallon air compressors on the market, but they’re all different and come at various price points. That means choosing one can be tough, so to help make your decision a little easier we’re going to look at the top options on the market right now. 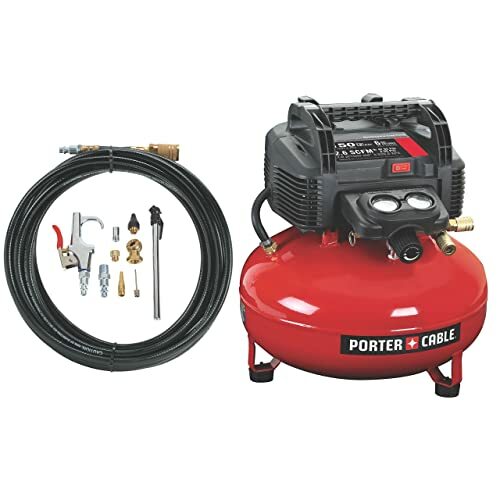 This PORTER+CABLE air compressor is not only the best 6 gallon air compressor that money can buy, it’s also one of the most popular small air compressors on the market. This oil-free air compressor is ideal to support multiple trim finishing nailers, small framing/roofing jobs and all general inflation, blowing and smaller SCFM air tools. It features two regulated, factory-installed air couplers to easily support two users. 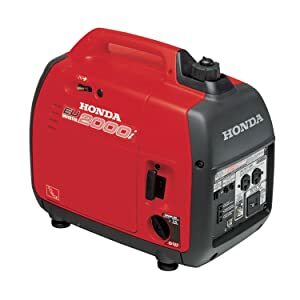 This compressor has a low-amp (10 amps), 120-Volt induction motor that starts easily in cold weather or with an extension cord. It delivers up to 150 PSI which allows you to drive more nails than a traditional 135 max PSI compressor. This pancake air compressor is designed for portability that is easy to transport to anywhere you want and won’t eat up precious storage space. It weighs only 30 pounds and features an integrated carry handle. The compressor’s body is made of steel for strength and has an upgraded shroud and console cover to protect its vital components. The PORTER+CABLE C2002-WK takes about 128 seconds to fully pump-up the 6-gallon tank to 150 PSI. The pump-up time isn’t overly critical, as the compressor only has to fill up once. After that, it only restarts when the tank pressure falls below a preset cut-in pressure – in the case of this compressor it’s 120 PSI. The compressor is rated at 82 decibels, which we find reasonably quiet. Overall, this PORTER+CABLE 6 gallon air compressor is very solid and well built. Light and compact, with plenty of PSI. And you can’t argue with the price. High-efficiency motor for easy startup in cold weather or extension cord application. Whether you are a do-it-yourselfer or a professional, the DEWALT DWFP55126 pancake air compressor is a Contractor grade model you can rely on. It’s one of the top-rated air compressors on Amazon. The DWPFP55126 features an electric motor that makes home use so much more convenient. The motor is oil free which means that there is no need to fiddly maintenance and periodic oil changes – just plug and go! The motor also draws low amperage (10 amp) which means you can plug it into a home socket without worrying that every time the motor kicks in to refill the tank, the circuit breaker trips, and plungers everything into darkness. This air compressor features 2 universal couplers to easily support two users, and a ball drain valve for quick & thorough tank draining. It has protective rubber leg covers to prevent marring. The DEWALT DWFP55126 is a 6 gallon air compressor that delivers up to 165 max PSI. It’s portable yet powerful, producing 2.6 CFM at 90 psi – enough to run 1 framing nailer or 3 trim guns. Plus, this air compressor is relatively quiet. At 75 decibels, it’s not the quietest model in our lineup, but it’s quieter than most other air compressors we reviewed. The only downside is the fact that it will not run first time each day unless the tank has been completely drained. Once drained and started it works well the rest of the day.The bottom line, Dewalt is one of the most trusted brands in the US, so you can expect many years of use from this model. Trust us! It’s one of the best and most portable 6 gallon air compressors out there, the manufacturer did not pay us to write this. 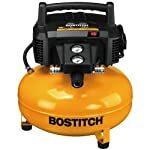 If you’re shopping for a reliable air compressor but are on the budget, this Bostitch BTFP02012 may be what you’re looking for. It’s one of the cheapest 6 gallon models you can get. Like our other recommended units, this compressor is great for tires and lightweight air tools. It delivers 2.6 SCFM of air at 90 PSI, which is quite sufficient to run brad and finish nailers, pinners, light-duty staplers, air spray guns, and even the occasional framing nailer. It boasts a decent 0.8 running horsepower and draws a full 10.5 amps. We also love its portable design. At only 29 pounds weight, and with a tank diameter of just 14″, this model is lighter and smaller than most other 6 gallon models. It allows you to use the compressor blow off in remote locations of your home during repair & maintenance tasks. Also good for filling car & bike tires. The lifespan of any compressor will be affected by a variety of factors, including maintenance habits and environmental conditions. Bostitch’s in-house testing rates the BTFP02012 with an average 450-hour design lifespan. That’s 450 hours of actual use. Assuming that you use a compressor about 2 hours per week – so you should be able to get about 5 years use from the Bostitch BTFP02012. That’s really impressive for a low-cost air compressor. 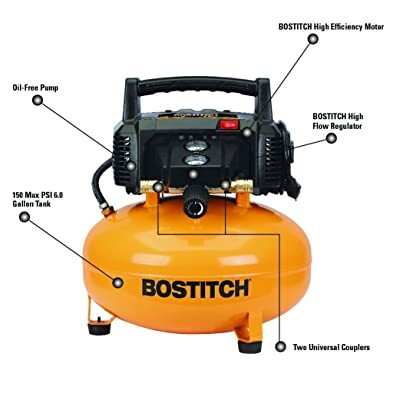 A light weight, reasonably quiet operation, and high CFM, coupled with an inexpensive price, makes the Bostitch BTFP02012 one of the best 6 gallon air compressors available. If 80 dBA is still too loud, consider the California Air Tools 5510SE Ultra-Quiet Air Compressor. At only 60 decibels, this model is one of the quietest air compressors in the industry. The powerful 1.0 HP (SP-9413) motor operates at only 1680 RPM creating less noise and less wear. The DEWALT DWFP55126 features an electric motor that makes home use so much more convenient. The motor is oil free which means that there is no need for fiddly maintenance and periodic oil changes – just plug and go! The motor also draws low amperage (10 amp) which means you can plug it into a home socket without worrying that every time the motor kicks in to refill the tank, the circuit breaker trips, and plungers everything into darkness. This air compressor features 2 universal couplers to easily support two users, and a ball drain valve for quick & thorough tank draining. It has protective rubber leg covers to prevent marring. This air compressor delivers up to 165 max PSI. It’s portable yet powerful, producing 2.6 CFM at 90 psi – enough to run 1 framing nailer or 3 trim guns. Plus, this air compressor is relatively quiet. At 75 decibels, it’s not the quietest model in our lineup, but it’s quieter than most other air compressors we reviewed. The only downside is the fact that it will not run first time each day unless the tank has been completely drained. Once drained and started it works well the rest of the day. If you’re shopping for a reliable air compressor but are on the budget, this Bostitch BTFP02012 may be what you’re looking for. It’s one of the cheapest 6-gallon models you can get. 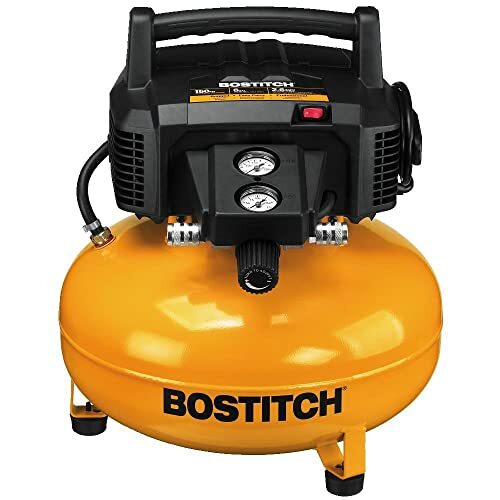 A lightweight, reasonably quiet operation, and high CFM, coupled with an inexpensive price, makes the Bostitch BTFP02012 one of the best 6-gallon air compressors available. The California Air Tools 5510SE has a preset range of 90-120PSI of air pressure for its 5.5-gallon stainless steel tank. It takes about 118 seconds to fully pump-up the storage tank from empty. You will see it’s faster than our top pick (PORTER+CABLE C2002 – 128 seconds), however, it’s due to a smaller tank and lower maximum PSI. Recovery time from 90 psi to 120 psi is 40 seconds. Even though the stainless steel makes that gallon slight heavy, the California Air Tools 5510SE is easy to move around and store with its overall weight of only 50 pounds. The machine comes with a wheel kit that allows you to install wheels on it for easy transport to different parts of the house or workshop. It also comes with a handle for easy lifting. With many good features and an extremely quiet operation, we understand why this air compressor gets such great reviews from both owners and fellow professional reviewers. At this time, the Hitachi KNT50AB kit has over 800 feedbacks with a 4.5 average star rating on Amazon, so that says a lot about the kit. In this kit you get a 6 gallon compressor and an 18 gauge brad nailer, plus an air hose. 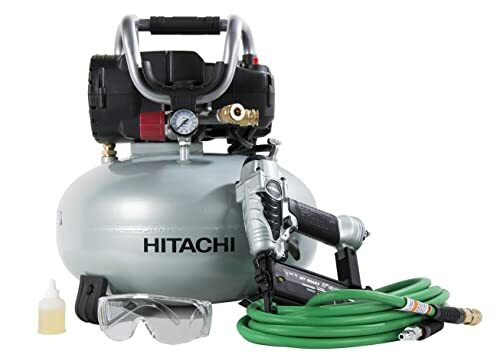 Hitachi’s compressors and nailers are top quality products at the moment, and believe or not, you can get all of them at less than $200. It’s a great deal for a kit that is from a company who makes quality tools. The EC710S Compressor is a 6 gallon, offers 150 psi, single phase universal 1 horsepower, with a 12 amp/120Voil-less motor. At 36.5 pounds, it is not cumbersome, but is rugged, as one would expect for the job site. 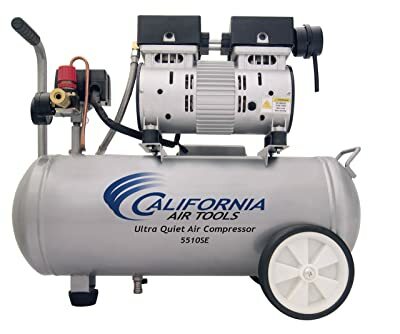 Plus, this compressor is a pancake style that is oil-less, which means it tends to run louder than its above competition – the California Air Tools 5510SE. However, at only 73 dBA, it’s much quieter than many others in this top list. The NT50AE2 Brad Nailer, at first glance, is superbly light. Weighing in at 2.2 pounds, it’s almost baffling that it doesn’t crumble in your hands, it’s that light. The aluminum body and slim design not only makes it lightweight, but you can really get into tighter spots. With its ¼” air inlet, operating pressure of 70-120 psi, and single/sequential actuation mechanism it comes as a great tool in a small package. Overall, if you’re looking for a high-quality kit and doesn’t want to break the bank, then look no further than the Hitachi KNT50AB Finish Combo Kit. With a noise output of only 53 dBA at 25 feet, the Eagle Silent Series EA-6000 hot dog air compressor provides welcome relief to the ears of contractors and home woodworkers alike. With no need to shout over the din of the compressor motor, it eases communication on the job site, as well as relations with family members and neighbors on the home front. Unlike lower-cost consumer units that die young & need to be replaced, this expensive model can provide users many years of use. We like the tough industrial design, strong metal tubing frame, and integrated steel face. It also features a maintenance-free oil-less compressor head, a lever-type drain valve and stainless steel braided discharge tubing. The Eagle Silent Series EA-6000’s slow RPM induction motor reduces noise, heat, and friction, while dual air intakes allow plenty of airflow. These attributes also promote less wear, resulting in a longer life. The 2.5 HP motor uses a cast iron cylinder delivers 125 PSI maximum pressure and 6 CFM at 90 PSI. This unit is able to handle the CFM requirement of most of the air tools, except probably a large task of sandblasting. You will not be able to find any unit that would be able to handle 6 CFM without being in the $500 price range and also the units already get much bigger and heavier and are intended to stay in a fixed location. Unfortunately, this Eagle Silent Series EA-6000 air compressor is slightly heavy. It weighs up to 96 pounds which is the heaviest 6-gallon unit we reviewed. It’s also pricey that can cost you 2-3 times as much as our top picks. However, with plenty of PSI and an extremely quiet operation, we think it’s worth it. One of the best 6 gallon air compressors money can buy. Makita is a worldwide manufacturer of industrial quality power tools and offers a wide range of industrial accessories. Their tools are top quality products in the industry and always come with expensive prices. The Makita MAC5200 Big Bore 3.0 HP Air Compressor is a must have if you have big jobs to get done. Fully packed with power, this compressor can run two framing nailers or a wide range of air tools. With the airflow of 6.5 SCFM at 90 PSI, the Makita has enough air power to fulfill every need of yours. This compressor uses a 3.0 HP, 3420 RPM motor that has a larger bore and bigger stroke than most of its size. We found that this unit has a motor that has a larger piston that when traveling the longer distance, it delivers a greater output than other larger compressors. The motor uses oil for lubrication and cooling. This does mean that you have to make sure that there is enough oil in the motor, unlike the others that don’t use oil. It has a clear oil level window so that you can monitor the level at all times. Compressors that use oil will last longer than the oil-free compressors, as long as you never let the oil run below the minimum level. So you can expect it will last for many years to come. “It’s very quiet, I’m able to talk to someone and still hear them without yelling!” is what we heard from a man who owns this model. This Campbell Hausfeld DC060500 – 6 Gallon Pancake air compressor is designed to be one of the quietest pancake air compressors in the industry. At 68 decibels, it’s slightly louder than the California Air Tools 5510SE or the EA-6000, but compared to other 6 gallon pancake compressors, it’s much quieter. So this compressor is ideal for anyone working where noise is a major issue. 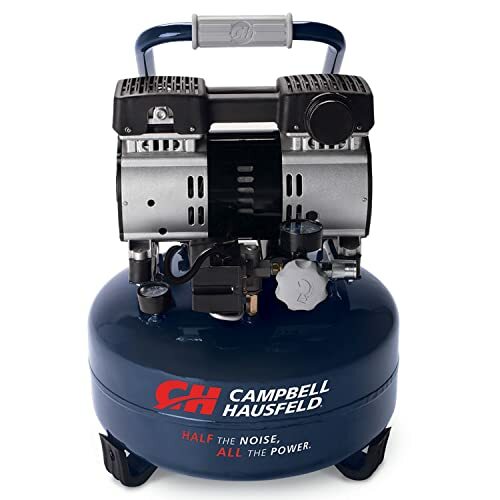 Campbell Hausfeld, one of the premier names in air compressors, air tools, and pressure washers. It makes this compressor easier for you to finish your projects like a pro. The DC060500 has a 1 HP, 7 amp induction motor that delivers 2.4 SCFM of air at 90 PSI (and 3.5 at 40 PSI), with a maximum PSI of 125, which is fine with tools like finish nailers, pinners, light-duty staplers, air spray guns, and other low air consumption tools. While you could use it with a finish or framing nailer the tank would likely be constantly recycling. It takes a full 75 seconds to initially fill the tank, but then only 35 seconds for recycling. The roll cage design provides reasonably good protection for the motor and the key compressor components, and the center-mounted handle provides good balance when carrying the compressor around the shop, job site or home. While this 6 gallon air compressor weighs up to 62.6 pounds, it’s small and truly portable. A rubber-grip steel handle makes it easy to carry and store. The Campbell Hausfeld DC060500 isn’t as powerful as our top picks. But it’s still one of the best 6 gallon air compressors you can buy, and is a decent option if our top picks are sold out.